The Austrian School of Economics is a school of economic thought, rather than a physical institution. It is based on the analysis of the purposeful actions of individuals. It is a very influential way of thinking which has spread around the world, and has been followed and improved upon by successful business thinkers. The Austrian School doesn’t have much to do with Austria, really, apart from the fact that Vienna was the origin of this school of economy (I am also from Vienna). Even though the foundations of the Austrian School were created centuries ago, I find this way of understanding economics very current, as it views the market as an entrepreneurial process. The main thinkers behind the current state of this theory are Carl Menger, Eugen Boehm von Bawerk, Friedrich August von Hayek, Fritz Machlup, Joseph Schumpeter, Murray Rothbard and especially Ludwig von Mises – accomplished entrepreneurs, economists, philosophers, and authors of revolutionary books and theses. A popular book, Road to Serfdom by F. A. Hayek, was crucial in helping in the revival of the classical liberal movement in America after the New Deal and World War II. Other books included new approaches on exchange rates, capital theory, and monetary reform – and many of the theories put forth are used in today’s markets. Some of them have become key in the evolution of business as we know it today. The Austrians are central to all of my books and thinking, because they comprise the only economic school of thought that assigns entrepreneurship a pivotal role in economic development. How does the Austrian School of Economics work? The method of the Austrian School of Economics is deductive—based on the premise that the economy is not just about amassing data and forever feeding it into complex abstract formulas to predict the unpredictable. Such formulas become so amazingly complex that they’re not even formulas anymore. Using deduction and logical implication of common truths (e.g., wants are unlimited, means are scarce) will push your business plan to a whole new level – one that isn’t just an abstract theory, but is open to the real world and communicates with it. The Austrian School aims to restore the economy as a human-based science, not just a neverending list of overlapping formulas. Carl Menger, Friedrich August von Hayek, and others demonstrated that capital is not homogeneous (composed of parts all the same in origin), but an intricate and diverse structure that has a time dimension. Currently, universities with a significant Austrian School presence are George Mason University, New York University, Loyola University New Orleans, and Auburn University in the United States, and Universidad Francisco Marroquín in Guatemala. Austrian economics are based upon these main principles, which consider individuality and subjectivity. Studying each individual by examining their thinking helps us deduce the effect of that individual upon the group — and foresee action. Such explanations, however, when judged by another individual or group, are still subjective from person to person. The Austrian School of Economics rejects the classical approach that states the price is determined by supply and demand or production costs. It asserts that the prices of commodities or services are defined by subjective needs, requirements and desires of the individual. Adding individualism and the aspect of time elucidates the concept of interest rates. The Austrian School sees money in relationship with time and its owner, who can either save or spend. All of the above in concert create an uneven economic map, which in turn creates business cycles. The entrepreneur is not only capable of seeing opportunities that others miss, but is innovative in taking advantage of them and exploiting them for profit, benefiting themselves, their companies, and their local and national economies. There were many authors and economists who contributed to the overall theory, but the most influential and well-known were Carl Menger, Ludwig von Mises and Friedrich August von Hayek. Menger was the founding father of the Austrian School of Economics, and was first to regard the economy as the result of individual actions rather than exact science. His works were rejected at first for being “subjectivist” and inaccurate, only to be praised later for unveiling the economy for what it really is: Individuals acting to satisfy their wants. Using his subjective theory of value he arrived at one of the most powerful insights in economics: Both sides gain from exchange. Learn more about Carl Menger. A student of Carl Menger, Mises was quick to evolve and push Menger’s philosophy even further. Explaining what causes business cycles—and being able to save Austria from the inflation that troubled Germany in 1920s—Mises is truly is one of the great minds of the Austrian School. His groundbreaking work on money and credit (and his deeper exploration of the individual need behind the supply and demand and the “price“ of money itself) solidified the position of Austrian economics in the world. Learn more about Ludwig von Mises. Hayek was a well-known philosopher, thinker, and author of his era, and is a legend in the world of economics. His theories became extremely popular in the 1970s, and in 1974 he was awarded the Nobel Prize for Economic Sciences. His theories proved that financial crises in history were a fabrication of powerful government manipulations – creating false booms, lowering interest rates, and more. His works defended the free market and free entrepreneurial spirit that drives business and the world of economy. Learn more about Friedrich von Hayek. With the Austrian theory of the business cycle—along with a new understanding of the sales process and the ever-changing approach towards market and economy in the modern world—it is evident that there is not much that can really stay constant and fixed, even within the snug, “precise” view of economic sciences. Economics cannot exist in isolation from the real world. Software development gives us revolutionary tools to break new ground and explore individual minds even more deeply, aiding the entrepreneurship within ourselves. The only thing that the economy can always rely on is the entrepreneurial spirit within people. We will conclude by defining society as a process (i.e. a dynamic structure) which is: spontaneous, and thus not consciously designed by anyone; highly complex, since it comprises millions and millions of people with an infinite range of constantly changing goals, tastes, valuations, and practical knowledge; and composed of human interactions (which are basically exchange dealings that frequently yield monetary prices and are always carried out according to certain rules, habits, or standards of conduct). All such human interactions are motivated and driven by the force of entrepreneurship, which continually creates, discovers, and transmits information or knowledge, as it adjusts and coordinates different people’s contradictory plans through competition and enables them all to coexist in an increasingly rich and complex environment. These concepts are the reason we developed the sales management software called Pipeliner CRM. Our product is based on the highly relevant findings of 150 years of economic history and economic theory as developed by the Austrian School. The objective is to provide the best possible support for entrepreneurship. The Austrian School began with a radical thought: What something called praxeology—a study of human action based on the notion that humans engage in purposeful behavior—was applied to economics? Praxeology says that people are not just reactive, they’re proactive. The things they do are purposeful. Perhaps the most purposeful and proactive people in any commercial enterprise—besides the entrepreneur that founded it—are the salespeople. They are truly the “entrepreneurs within the enterprise.” Or, as I refer to them, salespreneurs. Once you understand purposeful behavior, you see how salespeople make decisions. Once you know a bit about decision theory, you can plan for the types of things salespeople do and can support the ways they think and work. You can follow the natural order of things. These principles were woven into the very fabric of Pipeliner CRM. Instead of the top-down, management-heavy traditional CRM that makes salespeople cringe and turns them into box-checking automatons, Pipeliner CRM is built on the notion that salespeople naturally want to sell; they’re driven to it naturally, organically, entrepreneurially. Pipeliner gives them the insights and the tools to do just that: visualize and realize the sales goals they’re pursuing. 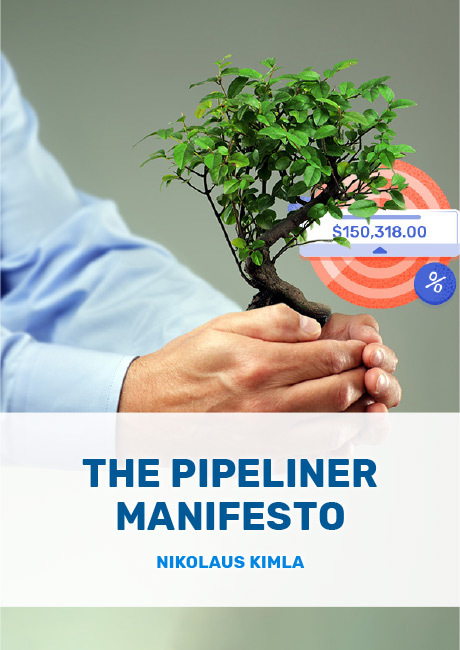 Pipeliner not only protects the entrepreneurial process, it empowers it. Learn more the basic principles we’re helping put into practice through Pipeliner CRM. 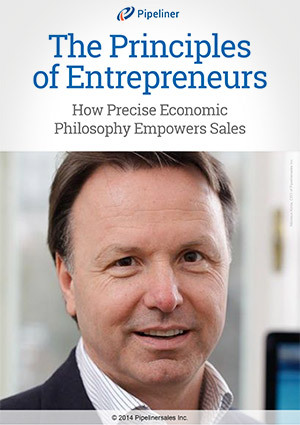 Download our free ebook The Principles of Entrepreneurs.